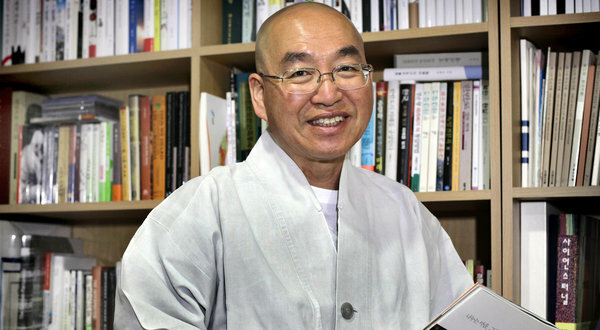 South Korean Buddhist monk Venerable Pomnyun in his office at Peace Foundation in Seoul, South Korea on April 4. IN August 1996, the Venerable Pomnyun, a Buddhist monk from South Korea, was cruising down the Yalu River between China and North Korea when he saw a boy squatting alone at the North Korean edge of the water. The boy was in rags, his gaunt face covered in dirt. Pomnyun shouted to him, but the boy did not respond. Pomnyun’s Chinese companion explained that North Korean children were instructed never to beg from foreigners. And when Pomnyun asked if the boat could be steered closer to the child to bring help, he was reminded that they could not enter North Korean territory. The encounter led him to establish one of the first relief campaigns for North Korean refugees and to take on an unlikely role for a Buddhist monk. Today, rather than leading a secluded life of quiet contemplation, he is a well-known commentator on North Korea, his online newsletter an important source of information smuggled out of the isolated country. Before his Yalu trip, Pomnyun had refused to believe his Chinese acquaintances’ stories about countless North Koreans dying of hunger as the country’s food rationing system collapsed in the midst of a famine. But once he was confronted with the evidence, the monk, who was already running a charity in India, sent volunteers to northeastern China, providing food and shelter for the thousands of North Korean refugees who had begun straggling over the river border. When his organization, Good Friends, released photographs of the bodies of North Koreans who had drowned in the river, too exhausted to complete the last leg of their desperate journey for food, it provided some of the first documentation of what was later recognized as one of the most horrific famines of the late 20th century. As many as three million people out of a population of 22 million died of hunger or hunger-related diseases. WHAT shook Pomnyun was not only the tales that refugees told of families trying to live on pine tree bark and wild roots, but also the outside world’s ignorance of their plight. Pomnyun’s group began to chronicle the disaster, interviewing more than 5,000 refugees as they arrived in China and publishing a series of reports and books on their struggles. When Good Friends began publishing its newsletter in 2004, it quickly became a must-read among South Korean policy makers and journalists. The first of its kind, the newsletter provided timely accounts of life in North Korea from anonymous informers inside the country, some of whom had returned home after being aided by the charity. They communicated via smuggled cellphones and other means that Pomnyun refused to disclose. When the newsletter, North Korea Today, also went online, it became a prototype for other Web sites. Together, the sites have helped breach what had been a near-total information blackout on North Korea for decades. They monitor the price of food and carry running, though sometimes conflicting, updates on floods and epidemics. Pomnyun leads his own temple in a provincial town, as well as study programs in meditation and Buddhist scripture across the country. Born to a rural farming family, Pomnyun grew up with older brothers who were religiously and politically active; one was sentenced to death under the military dictatorship of the time for antigovernment activity, but was later released. The younger Pomnyun at first hoped to become a physicist or an astronomer. But when he was in high school, a chance meeting with a revered monk named Domun persuaded him to become an activist, starting campaigns for environmental protection, religious reform, aid for the hungry and unification of the two Koreas. He was arrested and tortured by government agents cracking down on dissidents during the military rule. Today, Pomnyun pursues his mission very much amid the secular world. His office in Seoul is in a back alley crammed with restaurants, bars and “love hotels,” where people meet for trysts. Government officials call to compare notes on North Korea. He travels to the United States to give lectures attended by academics and government analysts. His social activism has even drawn him into the tumult of South Korean politics, especially after lectures that he organized for young audiences on topics like how to fight for social justice provided a platform for Ahn Cheol-soo, a software developer and a vocal critic of the governing New Frontier Party. Mr. Ahn is now cited in opinion polls as a leading contender in the presidential election in December, should he choose to run. POMNYUN’S tireless appeals for more aid for North Koreans have not always been popular in the South, where sentiment toward the North vacillates between compassion and fear. In 2006 and 2009, his group’s reports on destructive floods and an outbreak of swine fluin North Korea prompted the South Korean government to set aside politics and send aid. But his appeals have gone largely unheeded under President Lee Myung-bak’s conservative administration, which has accused Pomnyun of exaggerating the latest food crisis. Pomnyun has countered that the government is playing politics with people’s welfare. In 2008, he went on a 70-day hunger strike to highlight North Koreans’ plight. For that reason, Pomnyun is deeply skeptical not only of his own country’s policies toward North Korea, but also of the United States’ focus on the threat the country poses. A version of this article appeared in print on April 28, 2012, on page A5 of the New York edition with the headline: A Monk’s Earthly Mission: Easing North Koreans’ Pain.